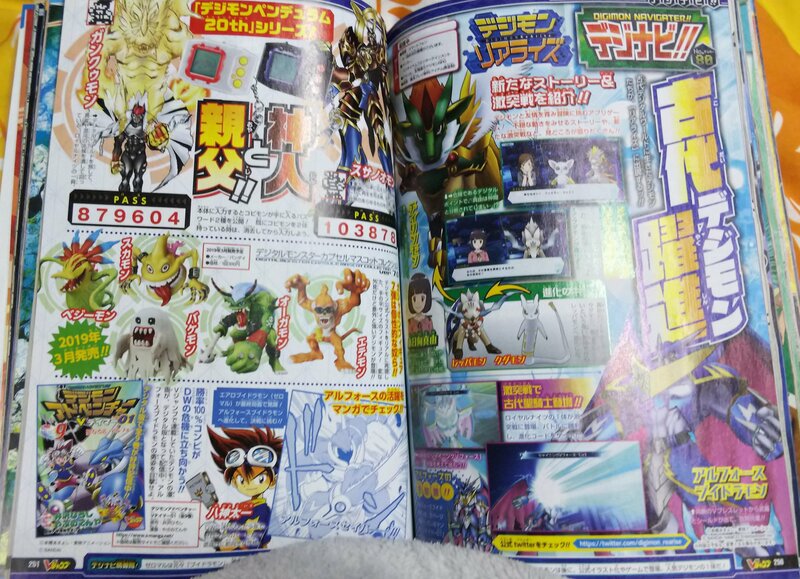 We have the first few pages from the March issue of V-Jump. First up is a look at ReArise. The last few issues have been showing off different evolution lines, and this time we get Kudamon, the partner of Mayu. In addition they show off ULForceV-dramon from a currently running ReArise event. Then we get 2 new Copymon codes for those who have the 20th Pendulums. The code for Gankoomon is 879604. The code for Susanoomon is 103878. This one had a larger photo with a bit more detail. After a few months of previews, we finally get to see the series 7 Digital Monster Capsule Mascot figures in color. The lineup for series 7 is Vegimon, Bakemon, Scumon, Ogremon, and Etemon. We also finally get a release date, which is March. Last up, another little V-Tamer preview for the currently available digital release of the manga, likely acting both as page filler and to tie into the V-dramon line showing up in ReArise. There should be two other V-Jump pages and we will update when we have them. Thanks to akatuki_d30 for the images. I'm surprised at two codes. I guess they wanna get through them faster now. This set is great, it's got 3 of the care mistake Digimon. Tehnically you get a bonus Digimon, because Chuumon. Although the quality of Chuumon looks a bit iffy. No new Digivolving Spirits figures announced yet? Bummer. This is all I want. The wait is killing me. The wait for the new Digivolving Spirit announcement feels like it's been way longer than usual, and it's killing me. If I recall correctly, back when the line first launched, we had 4 going on 5 figures lined up with release windows and everything by the time WarGreymon hit the shelves. Now we've only got one upcoming figure with a finalized design and confirmed release date, and it's a recolor at that. Hopefully we'll get a news blowout on that front soon. Hopefully this isn't derailing this topic too much. For what it's worth, the Capsule Mascots continue to look amazing. March's batch looks really good!! These are nice. We have more of those little figures and some more game info. Always nice to see.